Need to find a pet friendly hotel in Litchfield Park AZ? 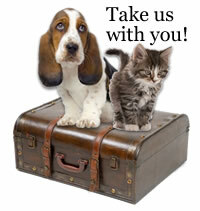 Click the Pet Friendly Accommodations Button below! Traveling with your pet whether it is a dog, cat or even a bird will make your vacation more enjoyable. On this city page and thousands more just like it for nearly every city in the World, you will find almost 26,000 pet friendly hotels and accommodations in the form of hotels, bed & breakfasts, small inns and vacation rentals. Want to visit a pet friendly beach or park? We have lots of them where your pet will be welcome. Taking your pet overseas? Look up pet immigration rules, find the necessary forms and check on pet friendly airlines in our Pet Immigration and Airline Rules sections. On vacation and need a pet sitter while you go out to dinner in Litchfield Park, find one in our database that will come to your hotel and "petsit" your best friend.